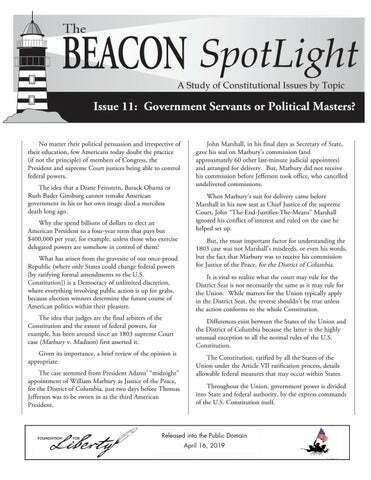 Issue 11: Government Servants or Political Masters? No matter their political persuasion and irrespective of their education, few Americans today doubt the practice (if not the principle) of members of Congress, the President and supreme Court justices being able to control federal powers. The idea that a Diane Feinstein, Barack Obama or Ruth Bader Ginsburg cannot remake American government in his or her own image died a merciless death long ago. Why else spend billions of dollars to elect an American President to a four-year term that pays but $400,000 per year, for example, unless those who exercise delegated powers are somehow in control of them? What has arisen from the gravesite of our once-proud Republic (where only States could change federal powers [by ratifying formal amendments to the U.S. Constitution]) is a Democracy of unlimited discretion, where everything involving public action is up for grabs, because election winners determine the future course of American politics within their pleasure. The idea that judges are the final arbiters of the Constitution and the extent of federal powers, for example, has been around since an 1803 supreme Court case (Marbury v. Madison) first asserted it. Given its importance, a brief review of the opinion is appropriate. The case stemmed from President Adams’ “midnight” appointment of William Marbury as Justice of the Peace, for the District of Columbia, just two days before Thomas Jefferson was to be sworn in as the third American President. John Marshall, in his final days as Secretary of State, gave his seal on Marbury’s commission (and approximately 60 other last-minute judicial appointees) and arranged for delivery. But, Marbury did not receive his commission before Jefferson took office, who cancelled undelivered commissions. When Marbury’s suit for delivery came before Marshall in his new seat as Chief Justice of the supreme Court, John “The-End-Justifies-The-Means” Marshall ignored his conflict of interest and ruled on the case he helped set up. But, the most important factor for understanding the 1803 case was not Marshall’s misdeeds, or even his words, but the fact that Marbury was to receive his commission for Justice of the Peace, for the District of Columbia. It is vital to realize what the court may rule for the District Seat is not necessarily the same as it may rule for the Union. While matters for the Union typically apply in the District Seat, the reverse shouldn’t be true unless the action conforms to the whole Constitution. Differences exist between the States of the Union and the District of Columbia because the latter is the highly unusual exception to all the normal rules of the U.S. Constitution. The Constitution, ratified by all the States of the Union under the Article VII ratification process, details allowable federal measures that may occur within States. Throughout the Union, government power is divided into State and federal authority, by the express commands of the U.S. Constitution itself. The Constitution grants Congress and the U.S. Government express powers and, while it prohibits the States from doing a few named things, it reserves the remainder of powers to the States themselves (or, if powers are not allowed any government, then to the people). However, for the District Seat, federal servants also have the separately-sourced power ceded by the “particular” State of Maryland in 1791, when the State ceded not only the land for D.C., but also the local governing power over it, to Congress and the U.S. Government. This action was in express conformance of Article I, Section 8, Clause 17 of the U.S. Constitution which outlines the District Seat, where members of Congress exercise “exclusive” legislation “in all Cases whatsoever.” In the District Seat, “exclusive” governing power means that power is NOT divided into State and federal authority like it is in the States—all governing power exercised in the 1 District of Columbia is federal authority, exclusively. Power is transferred in this unusual instance, as Clause 17 informs us, “by Cession of particular States” and “the Acceptance of Congress.” The word “particular” acknowledges a unique transfer of power—from a single State, all by itself, to Congress and the U.S. Government— something entirely different from normal transfers of governing power by all the States. Indeed, ratification of the original Constitution required each State of the Union to ratify the U.S. Constitution before the Constitution was established therein (under the Article VII ratification process). And, amendments later added require three-fourths of all the States to ratify them (under the Article V amendment process). It is critical to realize, however, that under Article I, a particular State—all by itself—may cede land and its governing authority over that land to Congress for special circumstances (including not only the District Seat, but also for “Forts, Magazines, Arsenals, dock-Yards, and other needful Buildings ” scattered now throughout the Union). Thus, allowable federal powers in federal enclaves go far beyond those allowed in the Union. While the U.S. Constitution expressly allows this unique transfer of authority by a single State, the actual transfer is not initiated by the Constitution or even by later amendments. Instead, power is transferred by single States “by Cession” (via State legislative Acts) and “Acceptance by Congress,” in each individual case. This unique transfer of power lies at the foundation of every apparent transgression of federal authority into the realm of the States, even those actions well beyond the District’s borders. Because of Clause 17, one must realize that it is wholly improper for Patriots to assert that members of Congress may never exercise State-like powers, such as those otherwise reserved to the States under the Tenth Amendment. Indeed, in the District Seat, the Tenth Amendment does NOT apply; it CANNOT. While Maryland reserved all of its powers it did not delegate when it ratified the U.S. Constitution in 1788 (which became operational in 1789), in 1791 Maryland ceded all remaining government authority over the parcel of land it ceded for the Government Seat. That cession in 1791 meant that once Congress accepted the land for the District Seat, no State authority remained in that ceded parcel. Without any reserved State powers within the District of Columbia, the Tenth Amendment cannot thereafter apply. All power therein is federal, exclusively. Indeed, the U.S. Constitution requires that the District constituted as the Seat of Government of the United States be governed “exclusively” by Congress “in all Cases whatsoever.” If Maryland had reserved powers in or over that ceded land, members of Congress would not be able to fulfill their constitutional obligations. 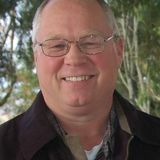 In the District Seat, members may exercise State-like powers even though they have nothing otherwise to do with the U.S. Constitution. While the local powers of Congress were undoubtedly meant to be contained within the geographic confines of the District not to exceed ten-miles-square—100 square miles (as well as the forts, magazines, etc. )—clever scoundrels discovered a devious way to expand this tyranny far beyond those boundaries. Before investigating the scheming extension of boundless powers, it is important to ponder the resultant implications. First, unlike States of the Union which must follow their respective State Constitutions, the District of Columbia has none. No State or State-like Constitution— or District Constitution—exists to enumerate, limit or control Congress or federal officials in the District Seat. With no guide, members and officials must therefore make up all their own rules as they go along, on their own, within their discretion (needing only to avoid a few express prohibitions, such as the found in the Bill of Rights). Second, unlike States of the Union that must also avoid violating the prohibitions the U.S. Constitution expressly imposes on “States”, the “District” is NOT a “State” and thus the U.S. Constitution’s express prohibitions on States do not apply in the District Seat. Third, since Article I of the U.S. Constitution allows only “States” to elect U.S. Representatives and U.S. Senators to Congress, local residents in the District Seat have NO Legislative Representation in Congress, even though legislative representation is the fundamental building block of the Union. After all, the Article IV, Section 4 guarantee of a Republican Form of Government again only applies to “States” and the District Seat is NOT a “State.” Thus, in the District of Columbia—without legislative representation nor its guarantee—there is no crime nor foul if members of Congress share their legislative power with unelected government bureaucrats of the alphabet agencies who thereafter enact law or for the courts to issue rulings held as law. The District Seat is the highly-unusual exception to all the normal rules of the Constitution that are otherwise applicable to all the States of the Union. Everything done over the past 200 years in apparent contradiction to the express commands and limitations of the U.S. Constitution is being performed under this unique exception to all the normal rules of the Constitution, cleverly expanded beyond its proper domain. Indeed, members of Congress and federal officials are able to exercise inherent discretion (beyond their constitutional parameters) only under this highly unusual exception. To begin making sense of centuries of government nonsense, realize, for example, that Marbury v. Madison involved a Justice of the Peace for the District of Columbia. Only from that proper perspective does Marshall’s opinion upholding inherent discretion make sense. Indeed, who is to say that the courts aren’t or shouldn’t be the final word on things allowed in the District Seat? Exempting Article I, Section 8, Clause 17 from the supreme Law of the Land wording of Article VI, Clause 2 would end two-centuries of federal tyranny, of the government being able to extend its local powers for the District Seat beyond those borders. In the battle between the two, the supreme Court upheld the letter of the Constitution, effectively nullifying its spirit (while simultaneously writing indecipherable court opinions to protect their newfound turf). No local powers of any State of the Union bind the nation—neither should Congress’ local power for the District Seat bind the nation just because it involves Congress. While ratification of this amendment would still allow the massive federal bureaucracy to remain (but now confined to D.C. [and federal forts, etc. ]), another option remains—which is to extinguish inherent discretion altogether. To end the reign of tyranny over every square foot of American soil, the States simply need to ratify a new amendment repealing Article I, Section 8, Clause 17 in its entirety (retroceding exclusive lands back to the State that originally ceded them [or, perhaps, allowing the District Seat to join the Union as a new State, on an equal footing with the original States]). An accurate diagnosis of the underlying problem is the first step to resolving it. Patriots face but one political problem even as it has 1,000 irrelevant symptoms—what I call, The Peculiar Conundrum—the odd phenomenon of members of Congress and federal officials being able to ignore their constitutional constraints with impunity. Only under the alternate power for the District of Columbia may members of Congress and federal officials exercise inherent discretion and bypass normal constitutional constraints. It is time now to close that deviant loophole or repeal it entirely. For more information, please see any of my ten public domain books, including my latest, Understanding Federal Tyranny, at www.PatriotCorps.org. it. Just because Marshall correctly ruled that no words of the current Constitution clearly exempt Clause 17 from being part of the supreme Law of the Land under Article VI, Clause 2, that doesn’t mean such words cannot now be added by simple amendment. Governmen Servants or Political Masters?